The New Museum inaugurates an annual convening of activists, artists, and educators to exchange knowledge and methods for generating critical discussion and structural change, while promoting safer and braver spaces. As a non-collecting institution working primarily with living artists, the New Museum is poised to be responsive to ever-present and increasingly urgent priorities of inclusiveness, while taking stock of activities relevant to contemporary art, education, and social change. The Museum has published two historical books on contemporary art and education to generate, assemble, and disseminate work in the form of essays, artist entries, and lesson plans: Contemporary Art and Multicultural Education (1997) and Rethinking Contemporary Art and Multicultural Education (2011). Over the last decade, the Museum has actively created content, tools, and methods for employing contemporary art as a resource for engaging youth and communities in questions and ideas that matter to them. 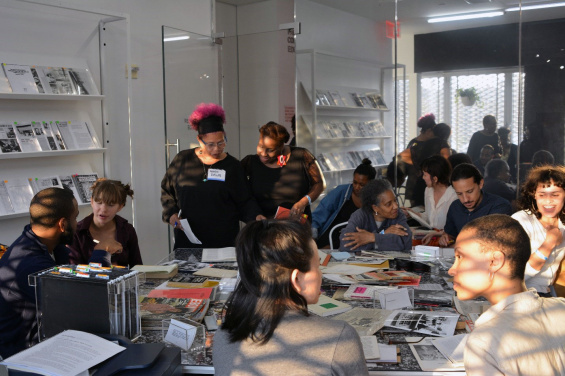 As the Museum considers its next step in making such tools and knowledge further available to educators, the new multi-day Convening for Contemporary Art, Education, and Social Justice invites artists, activists, classroom teachers, and educators in other settings to share best practices. The Convening will actively acknowledge the inequities of systemic power in schools, from curriculum development and evaluation to social and environmental conditions, while supporting student- and teacher-centered growth and learning. Aspects of these days will intersect with programming related to the annual Summer Social Justice Residency and Exhibition, “The Black School X Kameelah Janan Rasheed,” and will also include self- and community care for educators, participant presentations, and talks and workshops with guests and collaborators. The Convening will be organized with three interrelated themes relevant to the role contemporary art might play in space making. Where and how is the space for teaching and learning made within and beyond physical institutions? Architect and historian Mabel O. Wilson joins New Museum artists-in-residence the Black School and Kameelah Janan Rasheed for a panel discussion considering the role of visual culture, art, and architecture in the creation of spaces centering black teachers, learners, and knowledge within conditions of systemic and institutionalized racism. How might contemporary art in teaching and learning support environments that encourage brave conversations and actions that contribute to social change? How do we create room within challenges, such as standardized curricula, for marginalized stories and critically engaged imagination? Free to attend. The deadline to register is Tuesday, July 17. Activists, artists, organizers, and educators are encouraged to join. Please fill out this registration form. For any questions, please contact season@newmuseum.org. Support for public programs is provided, in part, by public funds from the New York State Council on the Arts with the support of Governor Andrew M. Cuomo and the New York State Legislature, and from the New York City Department of Cultural Affairs in partnership with the City Council.